Slippery when wet. When pavement is wet, reduce your speed. 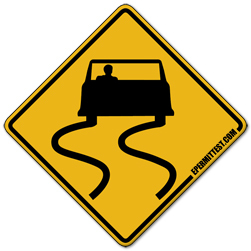 Do not brake hard or change direction suddenly, if you need to negotiate a sharp turn, do so slowly. Increase the distance between your car and the one ahead. These actions are needed on all wet roads and especially on roads where this sign is posted.